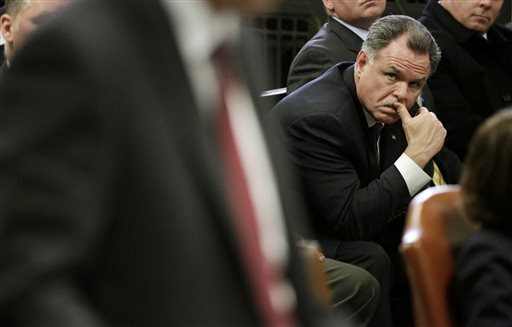 Chicago Police Superintendent Garry McCarthy, Feb. 4, 2015, in Chicago. Chicago Mayor Rahm Emanuel fired the police superintendent, and he is ordering a top-to-bottom review of the department&apos;s system of oversight, accountability, training and transparency. Mayor Rahm Emanuel fired the police superintendent. Garry McCarthy lost his job a week after authorities finally released the video. It shows a white police officer shooting and killing a black teenager. INSKEEP: For the mayor, the dismissal is a chance to mend police-community relations. His critics, though, are asking if, in firing the police commissioner, Rahm Emanuel was not aiming high enough. From Chicago, NPR&apos;s David Schaper reports. DAVID SCHAPER, BYLINE: Horrifying, that&apos;s how Chicago Mayor Rahm Emanuel describes the video of 15-year veteran police officer Jason Van Dyke gunning down 17-year-old Laquan McDonald as the teenager is trying to walk away. Action is needed, the mayor says, to prevent such abuses in the future and to repair the broken bonds of trust between the city&apos;s police officers and the communities they serve. RAHM EMANUEL: In order to bring the level of safety to our streets that every Chicagoan deserves, people must have confidence in our entire system. EMANUEL: That the public trust in the leadership of the department has been shaken and eroded. SCHAPER: So Emanuel asked police superintendent Garry McCarthy to resign, saying he had become a distraction. EMANUEL: Now is the time for fresh eyes and new leadership to confront the challenges the department and our community and our city are facing. SCHAPER: But many of the same criticisms community leaders level at McCarthy, they level at the Emanuel as well. They note that problems with excessive force and allegations of cover-ups as well as strained police-community relations go back years. So reporters asked the mayor if that by firing McCarthy he was avoiding responsibility himself. EMANUEL: I&apos;ve told - one, as I said, I am - I said it in my remarks. I&apos;m responsible. I don&apos;t shirk that responsibility. I have taken certain steps prior to this date. I&apos;m taking steps today. As I told you, this is a work in progress in finding a solution. It&apos;s not the end of the problem. SCHAPER: In addition to firing his police chief, the mayor appointed a police accountability task force Tuesday, ordering a top-to-bottom review of training, oversight and the culture within Chicago&apos;s police department. But even those who back Emanuel&apos;s dumping of the top cops say the mayor&apos;s actions don&apos;t go far enough. IRA ACREE: So this firing, it&apos;s a start. But it may be too little too late. Who else is a part of this cover-up? SCHAPER: This is Reverend Ira Acree at a community forum last night at a church on Chicago&apos;s West Side. ACREE: We need every entity of government, the mayor&apos;s office, the state&apos;s attorney office and the police department to be investigated from top to bottom. SCHAPER: The U.S. Department of Justice is reviewing a request from Illinois&apos; attorney general, Lisa Madigan, to investigate whether the Chicago department has a pattern or practice of discriminatory policing. But many want the feds to launch an even wider probe. Cook County Commissioner Richard Boykin. RICHARD BOYKIN: We&apos;re asking that the federal authorities look at the timeline and they look at whether or not there was an over effort to suppress the videotape to benefit someone&apos;s reelection campaign. SCHAPER: That someone is Mayor Emanuel, who was forced into a tough runoff election last spring. Members of the Chicago City Council&apos;s Black Caucus also want to hold hearings to grill Mayor Emanuel, his top aides and top police officials to ask what did they know and when did they know it. But many at this community forum wanted to shift the focus away from politics to actually fixing the problem of police mistreatment of the city&apos;s young African-Americans. JANEICIA WILLIAMS: The youth perspective in all of this is very important. SCHAPER: Janeicia Williams is president of the West Side NAACP Youth Council. WILLIAMS: The youth are growing up seeing police officers as the enemy. And that&apos;s really not the case. So in order to change our future, we have to work on right now. SCHAPER: Williams wants to see fewer stop-and-frisk and detain-and-arrest confrontations with police and more positive interactions in hopes of preventing another black teen from becoming the next Laquan McDonald. David Schaper, NPR News, Chicago.